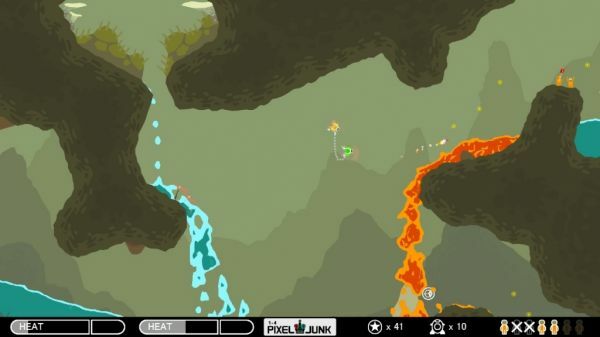 Q Game's Pixel Junk Shooter was released last year on the PlayStation Network, and by most accounts, it was pretty damn good. We would have liked to see some more co-op specific puzzles, but overall it was a beautiful and addicting game. G4TV talked with Q Games Founder Dylan Cuthbert about the sequel. "Normally sequels are just a re-hashing of the ideas in the original," said Cuthbert, "but for PixelJunk Shooter we still have a ton of ideas on the drawing board and the engine has lots of potential we want to use before moving onto our next idea. It would be a waste not to use it to try out more stuff." Like we said above, one thing we'd like to see is specific co-op puzzles where players must work together to solve the environments. Since the game is all about combining elements to create something different, it almost seems like a no brainer feature. No release date was given but you can be sure we'll keep you in the loop on any Pixel Junk Shooter 2 developments.